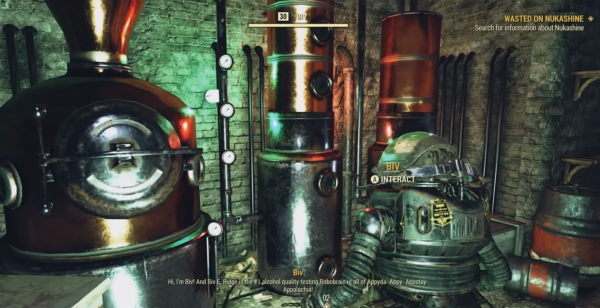 Fallout 76’s Wild Appalachia update is now available and it adds new a brewing system so you can create the microbrewery of your dreams. The Wild Appalachia update is now available to download and a new questline, Wasted on Nukashine, has been added for all players. Once you’ve completed it, you’ll be able to make and drink your own boozy beverages. A new area, Fraternity Row, has also been added to the map near Morgantown, and you can head straight there to get started. Alternatively, interact with one of the party invitation posters which you can find near the likes of train stations or civilised areas. You can also pick up a poster for free from the Atomic Shop, place it at your camp and have a wee read of it there. Before you get started, we’d suggest gathering any perishable ingredients needed for this quest last – you don’t want to go finding stuff only for it to rot and be crap quality when you’re making your signature cocktails. You’re heading to a Frat House, Pi, on Fraternity Road to investigate some goings on. There are a few Ghouls inside, so take care of those first and try to avoid using explosive weapons as it’s some close-quarters fighting. Once you’ve done that, head upstairs and check the Terminal in one of the bedrooms. Go to Messages and then to Nukashine, which will trigger the next section of the quest which is to drink Nukashine. You’ll find a bottle on the desk beside, so crack it open and have a drink. 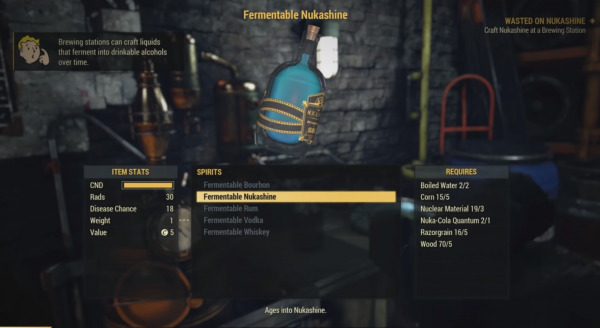 You’ll immediately start feeling the effects of the Nukashine and you basically need to wait it out until you’ve blacked out. You’ll wake up in a new area each time you drink Nukashine and there’s no telling where you’ll end up. Next, you need to read the label of the Nukashine bottle. There’s a riddle on the label which you need to solve involving finding a back door. You need to head to Big Al’s Tattoo Parlour in Morgantown. Check the back of the building and you’ll see a door with a Nukashine plaque beside it. Go inside and look at the reception Terminal. You’ll see that Big Al accepted a proposition from some enterprising youngsters who were leasing out his cellar, presumably making Nukashine. You learn that the Nuka Cola machine in the breakroom isn’t full of sugary beverages. Instead, it’s a doorway down to the cellar where you’ll find a speakeasy. There’s a Robobrain, Biv E. Ridge, who lives off alcohol down there, too. He’ll teach you the basics of brewing and fermenting your own Nukashine. Go item your Items and look at the ingredient list. If you’re missing items don’t fret, because they can be found nearby. As I said at the start, the best idea is to get the perishable items last. You’ll need to find the other half of this list which is in the Supply Locker room just off from the room you’re in. Go up to the Terminal on the wall and choose Restrictions – Supply Room. You’ll then need to find the password for the room, which is in the Eta Psi house. Head to the top floor of the building and access Judy’s Terminal. Select Personal Journals then Supply Room which will unlock the password for you so you can unlock the door. Once inside, you’ll learn that the secret ingredient is Nuclear Waste – yikes. You’ll be able to find three lots of it in the room you’re in. The rest of the ingredients like corn or boiled water are easy enough to find, even if you have to boil the water yourself. There’s a cooking station nearby to do just that. The only other ingredient that will be harder to come by is Nuka Cola Quantum. Once you’ve got everything, head back on over to see Biv who’ll tell you how to make Nukashine. You’ll start by using the Brewing Station where you can choose to make beer, spirits or wine. Choose spirits then select Fermentable Nukashine. You can wait it out or place it in a Flash-Fermenter to speed up the process until it becomes regular Nukashine. Once it’s aged, give the Nukashine to Biv who will test its quality and complete the quest. Now you’ll be able to place the Brewing Station and Fermenter in your camp. You could also plant the crops you need to survive and make bootleg booze at your camp to speed up the process. For more tips, tricks and walkthroughs, check out our Fallout 76 guide. 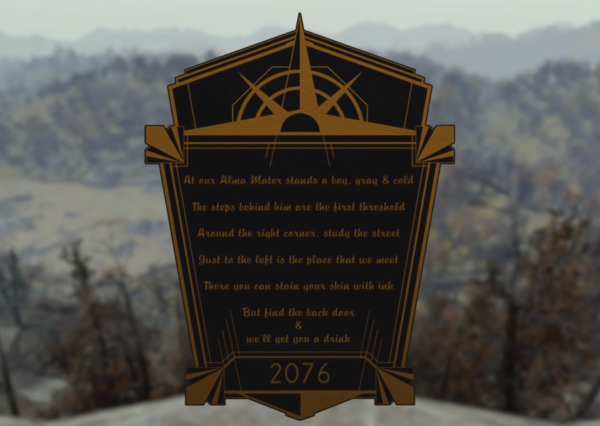 The post Fallout 76: Wasted on Nukashine quest guide appeared first on VG247.